I don’t like how Gladiator was directed. The jerky, hand-held camera work during the opening battle scene gave me a headache. Whenever I see that kind of direction (which rendered the 2009 remake of The Taking Of Pelham 1 2 3 unwatchable – well, that and really, really bad acting), I immediately think one thing: film-school student. Not graduate. Student. Sadly, that same headache-inducing cinematography appears again during the hand-to-hand combat scene around the 55 minute mark. And in every subsequent fight scene throughout the movie. As I type this, the movie is at the 1:46:11 mark. Maximus is in the arena. Tigers have joined the fray. But the camera work makes their presence look cartoonish. Or, as some like to call it, “edgy.” Someone needs to tell directors trying to be edgy that audiences don’t want edgy. They don’t want to see a director directing any more than they want to see actors acting. They want movies directed well, acted well, and scored well. Movie they can lose themselves in, become part of. Not movies that cause apoplexy from quick cuts, close-ups of eyeballs, horse’s hooves, or teeth flying out of one’s head because said head was sliced in half by a sword. I’d like to be able to say I like Gladiator. But I liked it better the first time I saw it – when it was called Ben-Hur. There’s a lot in common between this film and the superior 1959 film starring Charlton Heston. In both, the protagonist is betrayed by a close friend. Both are sold into slavery. Both go to battle and win their freedom. Both face, in the arena, the one who betrayed them. And both movies are epic in scope, even taking place around the same period of history. The biggest difference between the two movies is that in Gladiator, Maximus (Russell Crowe) doesn’t meet Jesus. But he should have. A miracle was sorely needed to elevate this movie to the same status as Ben-Hur. Original Music was provided by Lisa Gerrard and Hans Zimmer	. If it sounds familiar it’s because Zimmer scored the 1996 Sean Connery movie The Rock. A few passages sounded extremely Rock-like to my ears. 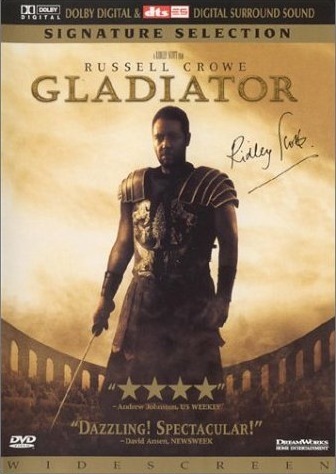 Gladiator was nominated for 12 Academy Awards and won five: Best Actor in a Leading Role (Russell Crowe), Best Costume Design, Best Effects, Visual Effects, Best Picture, and Best Sound. I think highly of Russell Crowe. I always have. He’s one of the most charismatic, riveting actors working today. But Ridley Scott’s jerky too-close camera work and some of the actors (who shall remain nameless) created a movie that always remained a movie to my eyes. I couldn’t get into it, suspend disbelief long enough to think I was doing anything other than watching a movie. Bottom line: Not even Russell Crowe’s immense talents could save Gladiator from being a movie I doubt I’ll ever watch again. And that’s unfortunate because this film features some of my favorite actors: Oliver Reed (Bill Sikes in another Oscar winner: Oliver!, 1968), Richard Harris (perhaps best known as Albus Dumbledore in the first two Harry Potter movies), and Derek Jacobi (who was brilliant in one of my favorite movies, Dead Again, 1991). All three of those actors are outstanding, truly magical, and wonderful. They were high points in Gladiator as well. But I just didn’t feel this film. I couldn’t get past the camera work during the all-important fight scenes. I always knew I was watching a movie, and a director trying to be edgy. Incidentally, Chocolat and Crouching Tiger, Hidden Dragon were both nominated for Best Picture alongside Gladiator. I would have preferred either one of those to this movie, and believe both to be superior to Gladiator.